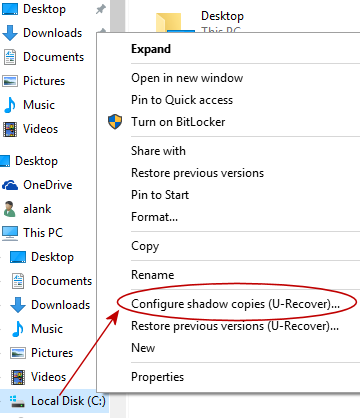 If you selected the installation option to Integrate U-Recover with Windows File Explorer you can configure volume shadow copies from inside of Windows Explorer using the right-click menu. Navigate to the root of the disk volume that you want to configure (for example, C:). While the cursor is over the root folder name, right-click the mouse button (or hold your finger down). A popup menu will appear (see below). You will see the UAC security prompt. Click on tap on yes to continue. U-Recover will automatically navigate to the panel for managing volume snapshots on the indicated disk volume. See the topic Managing Volume Snapshots.